SD: GCH ROCKSPRING DB DESE DELILAH 3*M 5-4 EX90 VVEE http://www.geocities.com/lrockspring/lmpg3.html#delilah 2nd 3 yr. old with 2nd udder behind herdmate Dandelion ('98 Nat'l CH) __ ADGA Nat'l show. 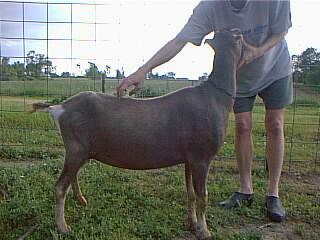 Hedwig's dam, Hattie, is a favorite of Ann Weikel's b/c she's always where she isn't supposed to be. Ann told me that 2001 was the first year she actually knew who Hattie's kids were sired by, because of her athletic prowess at breeding time. Hedwig is mischievous, just like her dam & . . . just like her dam, is also beautiful & correct. She is a rich chocolate with cream Togg markings & cute, little elf ears.